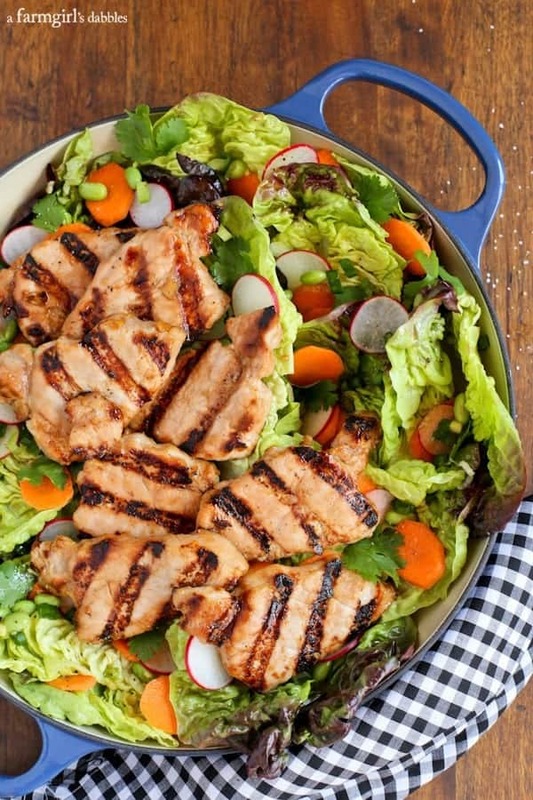 This Grilled Asian Pork Tenderloin Salad is fresh and healthy with greens and a bright honey-ginger vinaigrette. 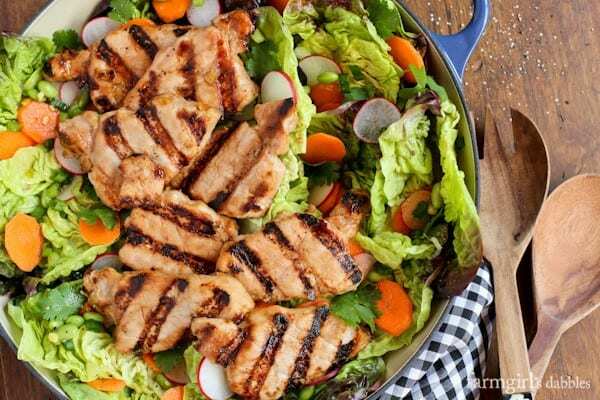 This Grilled Asian Pork Tenderloin Salad is wonderfully flavorful and easy to make. 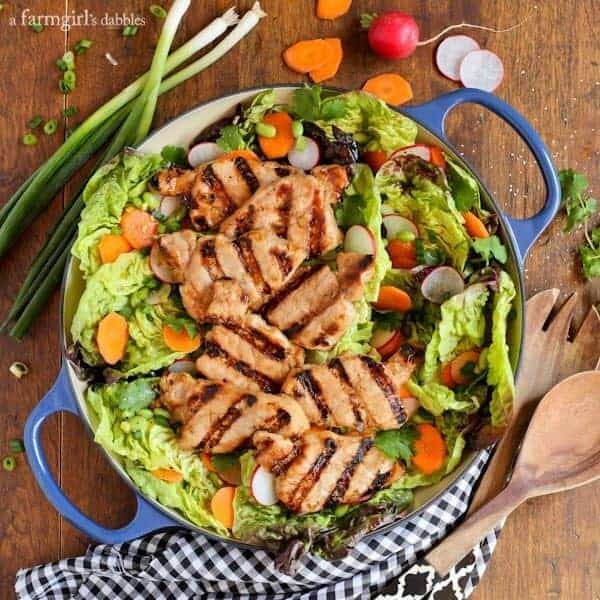 The tender grilled pork is perched on a bed of fresh greens drizzled with a homemade honey-ginger vinaigrette, offering a dish that is light and yummy, and oh so pretty. I created this recipe for the National Pork Board (NPB) and PorkBeInspired.com to further highlight the amazing versatility of pork. The great take-away my family got from this dish is that pork tenderloin doesn’t need to be cooked in its whole form that we are so used to. This technique, where we sliced the tenderloin prior to marinading and grilling, was a new one for us. In the past, we’ve only grilled or baked the tenderloin whole, and then sliced it prior to serving. Can I just tell you how awesome it is? And easy! Over the past month, I’ve been sharing with you about America’s love affair with pork, spinning off of the NPB’s recent exploration of 30 million social media posts about pork. Creating my own mashups of flavors and textures, I’ve been tempting you with delicious new pork recipes for you to make in your own kitchen. 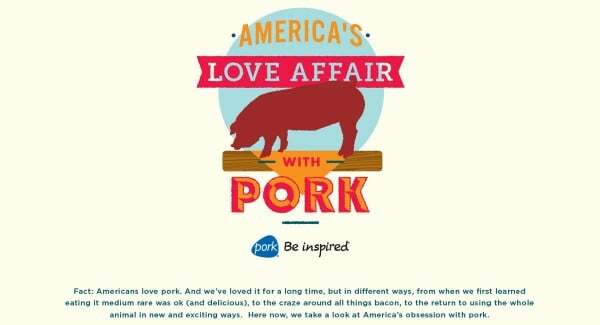 Read more about America’s love affair with pork right here. 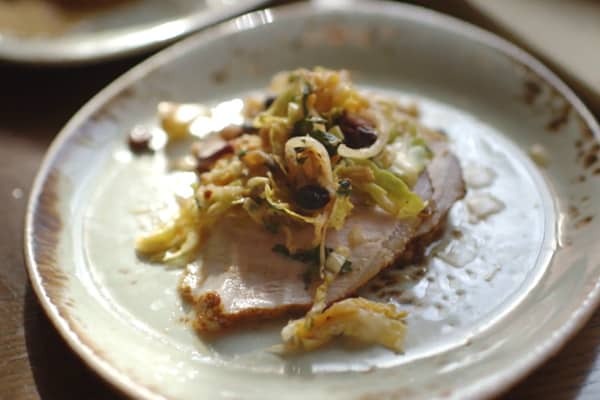 And be sure to check out this recipe from Chef JJ Johnson for Pork Suya with Kimchi, another awesome flavor mashup with pork. Here’s a video of the chef and this dish, plus find the recipe here. 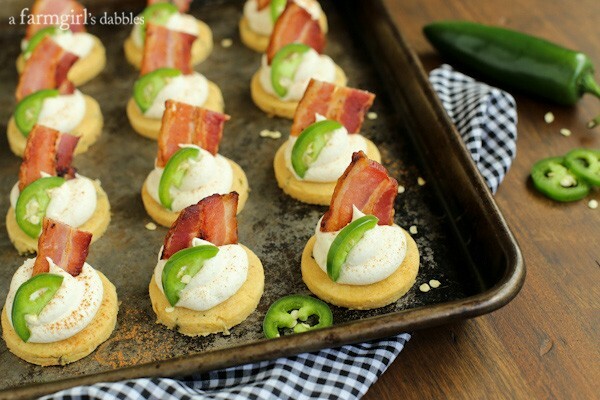 and my Jalapeño Corn Cakes with Honey Whipped Goat Cheese and Bacon. Such fabulous bites! To learn more about the NPB’s social media findings of trends in flavors, ingredients, and pairings, go here. My latest recipe, this grilled Asian pork tenderloin salad, promises to return to our table again and again. The pork tenderloin is first sliced, and then left to marinate for an hour in a tasty mixture consisting of honey, soy sauce, orange juice, and fresh ginger. The tenderloin pieces are then quickly cooked on a hot grill, leaving the pork juicy and perfectly pink and tender inside. I just love this new-to-me method of grilling pork tenderloin. If you haven’t tried this technique yet, you simply must put it on your list! While the pork is resting for a bit after coming off the grill, a big platter of fresh greens is prepared. I sprinkled mine with carrot and radish slices, green onions, edamame, and cilantro leaves, and then drizzled a light and lively homemade honey-ginger vinaigrette over it all. 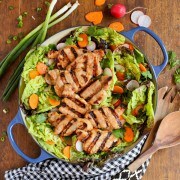 Then I topped the colorful salad with the charred slices of pork tenderloin, arranging them casually over the greens. Salads such as this make me so happy. Fresh and healthy with greens and a bright vinaigrette, and topped with tender and juicy pork protein, this salad both nurtures and sustains me. 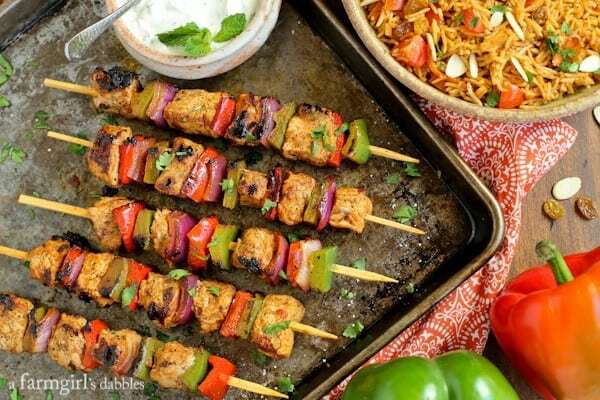 You can bet this is going to be a regular menu item at our house this grilling season. Place sliced pork in a large resealable plastic bag. In a medium bowl, whisk together remaining ingredients and then pour over the pork. Place marinating pork in refrigerator for one hour. Drain and discard marinade. 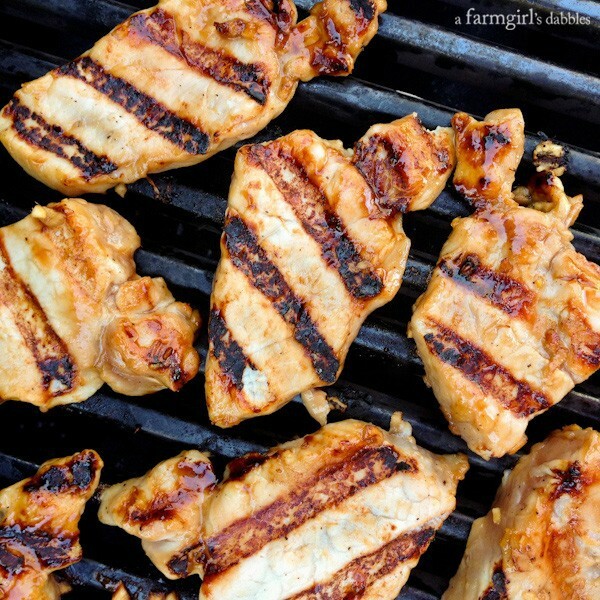 Heat grill to high and place marinated pork slices on clean grill grates. The pork is thin and will cook very quickly, and your goal is to have juicy, pink pork. Cook for about 1-1/2 minutes per side, or to an internal temperature of 145°. Remove pork from grill to a platter to rest for 3 minutes. In a medium bowl, whisk all ingredients together. This can be prepared many hours, or up to a day, in advance. The vinaigrette is actually better when it has some time for the flavors to mingle. Just store in the refrigerator and whisk again to incorporate right before serving. 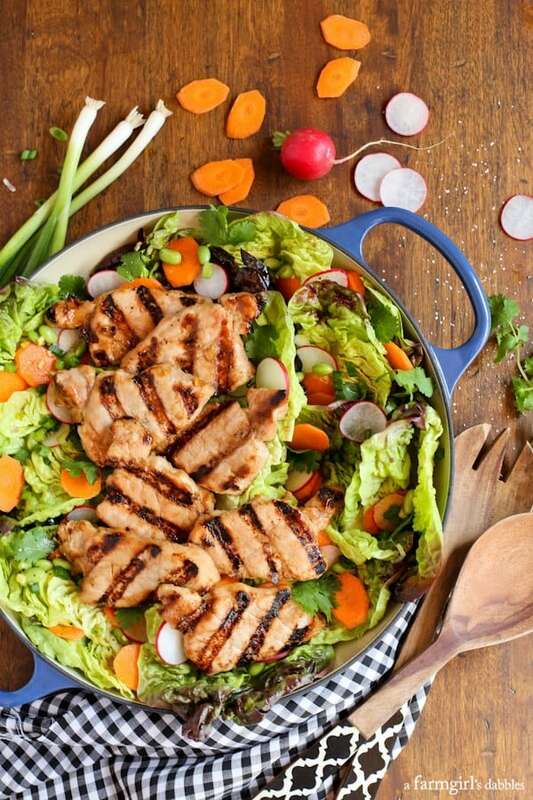 Layer lettuce greens on a large serving platter with carrots, radishes, green onions, edamame, and cilantro. Drizzle some of the honey-ginger vinaigrette over the top. Sprinkle with a bit of salt and pepper. Then arrange grilled pork tenderloin slices casually over the top, leaving plenty of green salad showing. Serve immediately. Disclosure: This post is sponsored by the National Pork Board. Thank you for supporting the brands that I carefully choose to work with, that help make this site possible. All opinions are 100% my own.